Many of you are gearing up for the next season: fall and halloween. Because of this, I will feature several fall & Halloween themed tutorials this month. I featured the first tutorial last week, how to make your own simple polymer clay pumpkin the tutorial this week is a little different. This is a basic polymer clay tutorial that you can adapt to make your own fearfully frightful, or wonderfully cute polymer clay witch. Last week I sent out a teaser image on FaceBook that looked similar to the one at left. To get more teasers and some awesome inspiration, be sure to “like” my FaceBook page. Use the instructions at the right to see how you can see more updates and get more fabulous freebies from my heart to yours. 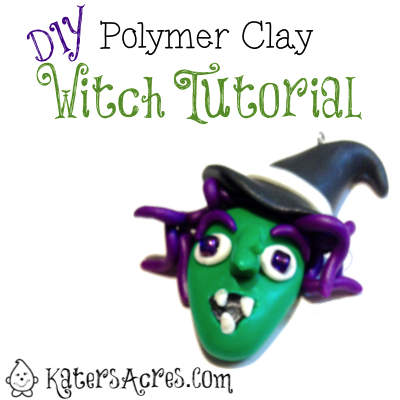 Polymer Clay Witch Tutorial – Suitable for fondant & other mediums http://t.co/fPl4leqStx Click to make your own today! The best sculptors have two things in common. They will tell you that the most success in sculpting comes from having perfectly conditioned polymer clay and starting every sculpt with one basic shape …. the perfectly rounded ball. From a ball of clay you can make a square, teardrop, oval, and dozens of other shapes you will need to be a successful sculptor. In order to make a witch from polymer clay, follow these steps as a guideline and use your own creativity to come up with a scary or friendly (as shown above) polymer clay witch. Roll clay into a ball (see note above). Roll clay into a teardrop shape for an elongated witch face. Gently depress two indents where the witch’s eyes will be. Gently roll a pointed witch nose (start with a ball, then a teardrop, and shape into a pointed triangle) and attach to the un-indented part in the middle of the face. Add a wart if you want to! Roll two small rounds of glow-in-the-dark clay for the “whites” of her eyes and gently press those into the eye sockets. Using the embedded bead method, pick eyes and insert them into the glow-in-the-dark rounds. This will flatten them out as the bead is “smooshed” into the clay. Add eyebrows to the top of the “indents” in the color of clay you will use for your witches hair. Or, make it stick out something funny and use a different color than the hair for a unique whimsical look. Make a gentle indent in for the mouth using a ball tool. Add just a tiny pinch of black clay to the indent and smooth out using a ball tool or your finger. Make triangle shaped teeth from polymer clay and attach to the mouth area. Roll a snake of purple clay and cut into strips to form hair. Attach the strips to the head by gently pushing down to secure them. Then gently twist and curl allowing the clay to twist the direction it wants to go. Roll a ball of black clay. Form it into a tear drop. Flatten it to the table slightly. Gently pull a “rim” from the bottom section. Now gently shape the “point” of your witch hat to get it took look the way you’d like. Using a piece of wire, attach the witch head to the witch hat. Insert a micro screw (or an eye pin) if you are going to use this as an ornament or a pendant.